If you’re planning to acquire a vacuuming robot to finally liberate yourself from one of the most boring, tiring, cumbersome and annoying house cleaning jobs, there is a good chance that you've been considering one of these very popular three brands: iRobot Roomba, Neato Botvac and bObsweep bObi. Each of these three brands offer multiple robots which makes deciding which to select even harder. 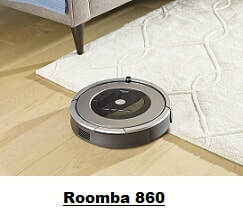 Note: If you'd rather see a comparison of top WiFi robots, please click: iRobot Roomba 980 & Neato Botvac D7 Connected Comparison (at the time this article was written, bObsweep did not have a WiFi supporting vacuuming robot). 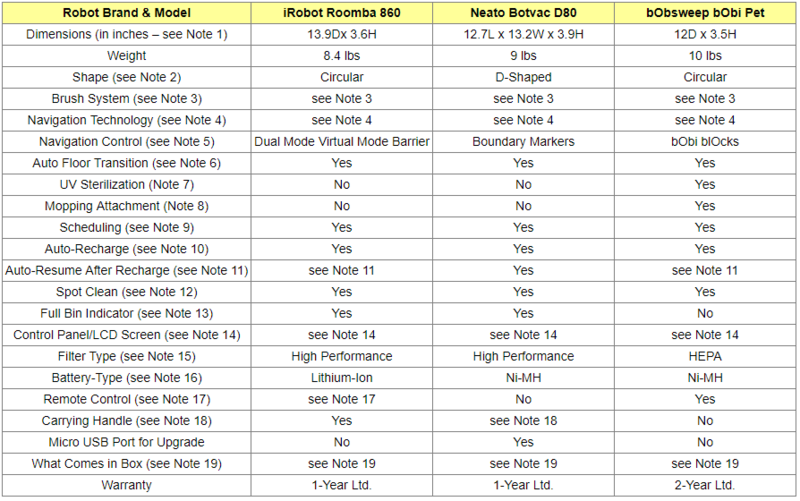 This article will compare iRobot Roomba 860 with Neato Botvac D80 and with bObsweep bObi Pet. These were not just the most popular among Amazon customers at the time this article was written, but they had also received excellent reviews from most Amazon buyers (an average of at least 4 stars each out of 5 stars!). Selected Vacuuming Robots on Amazon. bObi Pet is the thinnest of these three robots as it is only 3.5" in height, as opposed to 3.6" for the Roomba and 3.9" for the Neato Botvac. This means that bObi Pet can go better under low lying furniture. bObi Pet is also the narrowest of the three as it is 12" wide as opposed to 13.9" for the Roomba and 13.2" for the Neato Botvac. This means that bObi Pet can pass better through narrower passages. All three robots are equipped with side brushes, but because Neato Botvac D80 has a semi-rectangular D-shape, it is reasonable to think that it can be even more efficient in cleaning wall edges and corners. Roomba 860 is equipped with two debris extractors (front and rear) that grab and break down dirt and debris eliminating hair tangles and jams. A spinning side brush cleans along wall edges. In addition, an airflow accelerator creates a sealed channel that concentrates the airflow, sucking in all the debris. Thanks to the high efficiency vacuum created, the air power is increased 5 times in this robot compared to previous models of Roomba robots. Neato Botvac D80 can be equipped with three types of brushes: a spiral blade brush which combined with Neato's powerful vacuum suction removes easily debris, dirt and fibers; a combo brush which combines the cleaning power of blades and bristles and offers superior pickup of pet hair; and a side brush for thorough edge cleaning which allows the robot to get deep into corners and right up against walls as well as base boards for superior cleaning coverage. Roomba 860 iAdapt technology uses acoustic and optical sensors that detect obstacles as well as dirty areas and knows where to spend more time cleaning. It uses over 40 robotic behaviors and makes more than 60 decisions per second to ensure every section of the room is cleaned making multiple passes over every area. Neato Botvac D80 is equipped with a laser eye that uses infrared light to scan the surroundings and uses the Simultaneous Localization and Mapping (SLAM) technology to build an accurate map of the room and any obstacles. Using this map, the robot is able to efficiently clean the floor in a pattern of straight and overlapping lines, avoiding obstacles and never missing a spot. bObi Pet is equipped with highly responsive infrared sensors and over 80 touch sensors on her front, sides, and bottom. It is well equipped to detect dirty areas, and the infrared technology helps the robot detect and avoid most obstacles and drops. Note that if an object is extremely dark (i.e black in color), it is less likely to be detected by the infrared, so the robot uses its touch sensors to detect it. Both the map based and sensor based navigation methods have their advantages and drawbacks. The map method used by Neato makes sure that the entire floor surface is covered, which is great, but since the Neato does not do multiple passes on the same spot, it may leave some stuck dirt behind. On the other hand, strictly sensor based robots will locate all the dirty areas and vacuum them until they are clean, but they might not cover certain areas of the floor that are not dirty enough to be detected by the sensors. Of course, in either case a spot clean, available with all three robots considered here, can be invoked to complete the job. To prevent the robot from entering off-limit areas, Roomba 860 robot uses Dual Mode Virtual Wall Barriers which are battery run small devices that can be used to block off an open doorway, but they can also be used as Virtual Wall Halos to protect some restricted area within the room, like for instance the area where the dog food might be. With bObi Pet, you can use the included bObi blOck for containment of the robot's cleaning zone by creating an invisible boundary line that it will not cross. The barrier that bObi blOck creates can help you section off a room, protect delicate rugs, and keep the robot clear of fragile items in your home. A bObi blOck unit needs 4 AA batteries. All three robots can transition with ease between different types of floors, be it hardwood, laminate, tiled or carpeted. bObi Pet is equipped with a UV light to sanitize the floor as the robot vacuums. The UV light disinfects and kills bacteria. The robot has a button on its remote control device to control the UV light. Note that the default state of the UV light when the robot starts running is on, but you can toggle it ON and OFF. bObi Pet comes with a mop extension and two mini microfiber mop cloths that can be attached to it. Once the mopping extension is installed and the mopping cloth attached to it, the robot can mop at the same time as it is sweeping, vacuuming, and disinfecting. The microfiber mop cloths included may be used either dry or damp, with water or your favorite cleaning product, to remove stains from tile, laminate, concrete, wood, and any other type of hard flooring. ​When the battery gets low, all three robots return to the charging base to recharge themselves automatically. Neato D80 auto-restarts after it has recharged itself and resumes the vacuuming where it was interrupted. This allows seamless coverage of very large surfaces and entire floors. Roomba 860 has to be restarted after the auto-recharge unless it was scheduled to start later. Note that if you want a Roomba robot with the auto-resume feature, you will need to consider the Roomba 980 which also supports WiFi and can be controlled from your smartphone (see intro section above for link to an article comparing the Roomba 980 with Neato Botvac D7 Connected ). With bObi Pet, there is a setting on the robot that can restart a new cleaning session. Although, the robot will not pick up exactly where the job was interrupted before it recharged, the long lasting battery will usually have enough juice to cover any uncompleted sections of the vacuumed area. Spot cleaning allows the robot to focus on a limited area that can be selected and that requires more intense vacuuming. All three robots provide the spot clean functionality. With the Roomba and Neato robots, there is a SPOT CLEAN button that you press to invoke this function. ​With bObi Pet, you press the WAFFLE button to spot clean. Both the Roomba and Neato robots have indicators that show when the bin gets full. They also emits an audible sound. bObi Pet does not have a full bin indicator. It is recommended to empty the bin after every vacuuming session. Roomba 860 is equipped with a number of buttons on the robot (see image below) that allow you to turn on the robot, to invoke a cleaning session, to spot clean, to dock at charging base, and configure scheduling. When scheduling the robot, all time related parameters are displayed on the robot as they are set. The robot is also equipped with a number of status indicators (such as battery indicator, full bin indicator, etc.). bObi Pet has a very simple cover with very few control buttons, as most controls are invoked from the remote control device. The only control buttons on the cover are the "GO! ", "JUICE" and "WAFFLE" touch buttons (see image below). - GO! activates advanced movement algorithms to vacuum the room covering the most ground. - WAFFLE targets a dense spill area (spot clean). The robot traces a grid pattern on the spill zone to treat it with special attention. - JUICE locates the charging station and auto-recharges the robot. bObi Pet is equipped with a HEPA filter. HEPA stands for "high efficiency particulate air" and is a filter grade defined by the US Department of Energy which requires the filter to be able to remove more than 99.97% of particles. Roomba 860 is equiiped with an AeroForce High Efficency filter that can capture 99% of allergens, pollen, and particles as small as 10 microns. Bobi Pet and Neato Botvac D80 are equipped with Ni-MH (Nickel–Metal Hydride) batteries. Roomba 860 has a Lithium-Ion battery. bObi Pet comes with a remote control device. ​No remote control device is included with Roomba 860. But Roomba 860 is compatible with the optional iRobot remote control device which can be purchased separately. See Amazon products section below for the optional Roomba remote control device. There is no remote control for Neato D80. If you need to control your Neato remotely, you will need to get the Neato Botvac Connected robot which supports Wi-Fi and can be controlled from your smartphone (see intro section above for link to an article comparing the Neato Botvac Connected robot with Roomba 980). Neato Botvac D80 does not have an explicit handle, but there is a recessed handle located between the spot clean and home buttons, just in front of the dust bin. Though bObi Pet does not have a built-in carry handle, it is very easy to lift and carry. ​For exact price information on the above compared robots, please refer to the Amazon section below. So which of the three robots is best for your home? Powerful filters (HEPA and High Performance) that clear the air from allergens. ​The Dual Mode Virtual Mode Barrier can be used to block off an open doorway, but they can also be used as Virtual Wall Halos to protect some restricted area within the room, like for instance the area where the dog food might be. ​The certified High performance filter. The Boundary Markers which do not require any batteries and which are used to prevent the robot from entering off-limit rooms and areas. Existence of a USB port that can be used to upgrade robot's version/features. No USB port on Roomba 860 and bObi Pet. The ability to UV sterilize the floor while vacuuming (no such function on the Roomba or the Neato). ​The ability to mop the floor while vacuuming (no such function on the Roomba or the Neato). Its sophisticated remote control device equipped with a detailed screen. Its smaller size which allows it to go better under furniture and through narrow spaces. The included bObi blOck that can be used to prevent the robot from entering off-limit areas. The 2-year warranty (as opposed to 1-year for the Roomba and the Neato).